Cumulus Delivers Country from Nashville. When you think about Nashville, the first thing that comes to mind is probably music—particularly country music. In 2013, Cumulus launched the NASH brand of country music lifestyle and entertainment programming with NASH FM 94.7 in New York City as the flagship station. In 2014, the NASH brands received new headquarters as Cumulus constructed the NASH campus and studio facilities in the heart of Nashville. The NASH label encompasses a number of brands spanning various multimedia platforms including “America’s Morning Show,” “NASH Nights Live with Shawn Parr,” “American Country Countdown with Kix Brooks,” “Kickin’ It with Kix,” and others. All of these brands originate from the new campus. Radio magazine interviewed Gary Kline, Director of Engineering for Cumulus about the new facility. Radio: This truly is a unique facility. Tell me a little bit about some of the main design goals behind the NASH studios. Kline: The goal was to lay the foundation for a cutting-edge broadcast and production facility to support our NASH brand globally. We intend for this property to become a campus with various production facilities located on our expansive property near downtown Nashville. We wanted the very latest and most modern technology for audio, video, and multimedia production. One of our design goals was to ensure we could distrib- ute and produce high quality HD video, and the very best audio content for broadcast, streaming, web, television, etc. All of this had to be handled in an efficient manner so that we could maximize our production capabilities while retaining the ability to reconfigure and respond to new programming requests quickly. We also incorporated space for our publishing partner, Country Weekly Magazine. They have a full editorial room as well as storage and conference areas. Radio: Building a new facility always comes with unique challenges—I can imagine the challenges are even greater when building a facility designed for national origination of an entire family of brands. Can you tell me a bit more about some of the challenges that you faced during the design and build process? Kline: Essentially we gutted the old Citadel facility down to the concrete floors and steel rafters. Before we could do that, however, we had to move WGFX and WKDF over to our other large broadcast facil- ity at Music Circle. WGFX is a sports/talk station with a complex format, and the flagship station for the Titans. Building new studios for them was no small task, and that had to be done before the operation could be moved. The same is true for WKDF. A lot of work had to be done at Music Circle to expand and prepare our existing TDM audio routing system to accommodate the new family members. Hats off to our excellent Nashville engineering team, which handled this large project. Another challenge (after we cleared the building of live broadcast stations) was designing the new layout, which had to accommodate both radio and television studios. We brought in an architect and interior design firm to assist us with this. The design was an iterative process with many meetings to hash things out. The challenge was not only figuring out what went where, but also thinking in terms of the future. For example, we had to make sure we had enough rooms allocated for video and audio production to handle growth over a period of years. Another example was that we installed floor conduits and cable jacks throughout the facility in case, for instance, one day we decide to rearrange the studio furniture. If you pick up the floor rug in Kix’s studio you’ll see what I mean! Oh, one other interesting challenge—one that I think we nailed…Installing multiple monitors and mics without blocking camera angles. Check out Blair’s studio. Nash Nights studio furniture with guitar neck legs - made by Omnirax. Radio: So how long did the project take from initial concept to completion? Kline: There really were a couple of periods of time here. 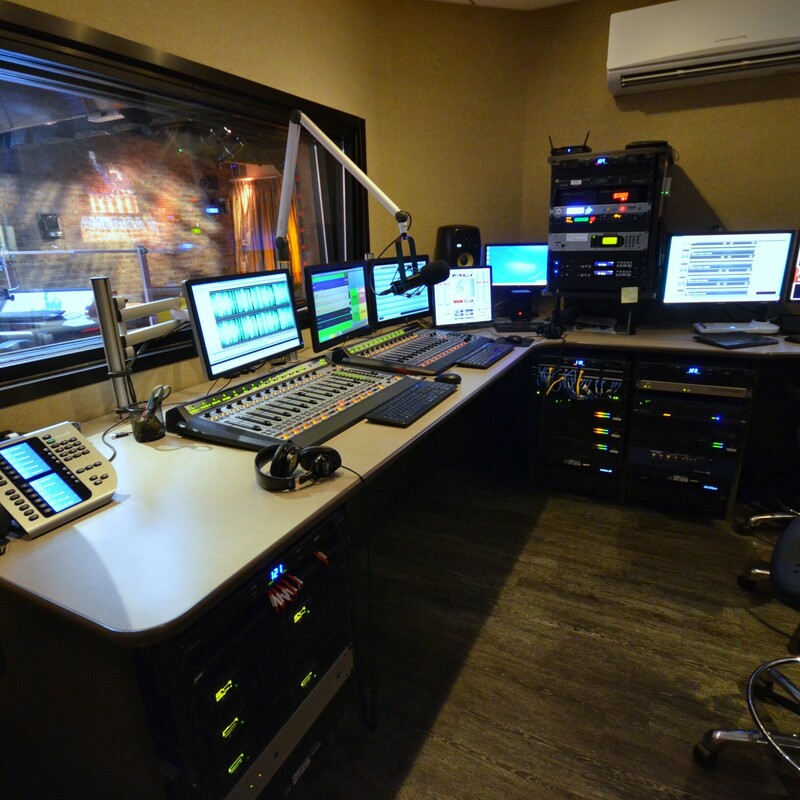 It is important to note that we built the facility in different phases with Kix’s studio being Phase 1, America’s Morning Show with Blair Garner being Phase 2, and NASH Nights Live being Phase 3. We are working right now on a Phase 4 studio as we are regularly engaged in supporting our brand. That being said, I think it was July of 2012 when we first decided to begin designing the facility. It was then that we hired an interior design firm and began working on plans. We ultimately hired two different architects shortly thereafter. We used two different firms in part because we needed stamped plans, and were seeking guidance on certain construction and design elements. The next step in the process was equipment selection and studio furniture design. By January of 2013 we had a General Contractor on board with plans in hand. In March of 2013, we moved Kix into his beautiful new studio where American Country Countdown and Kickin’ it with Kix is produced. The design, planning, bidding, permitting, and demo work took longer than building the first phase. Once we had all of our ducks in a row it was full steam ahead, not unlike most studio projects. Blair’s studio went online from NASH campus around September of 2013. 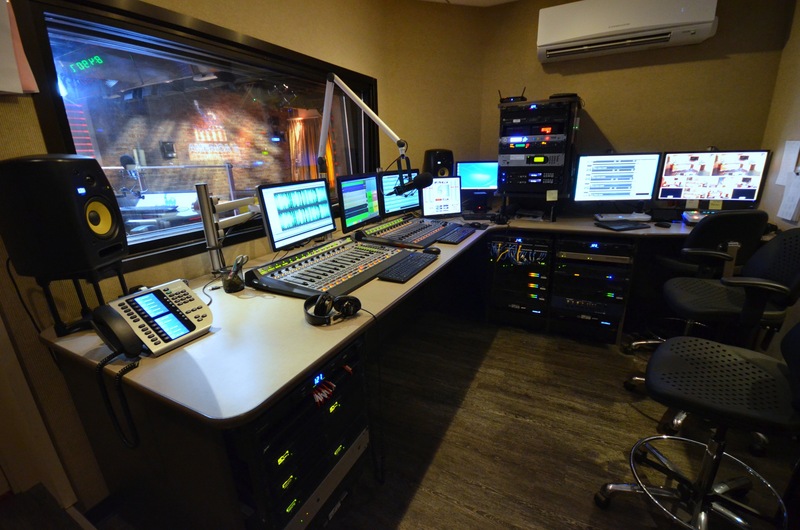 He broadcast his show from temporary studios at Music Circle until the new studio at the NASH campus was ready. This transition period gave us a chance to work out a lot of bugs before we moved him and his broad- cast crew over to the new studios. 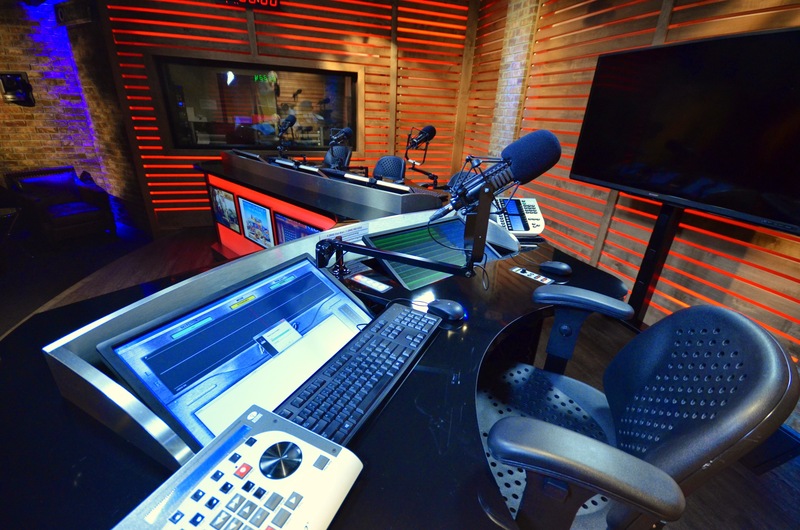 NASH Nights Live began broadcasting from their new Phase 3 studio in January of 2014. Radio: Who were some of the key equipment manufacturers for this project? Choosing from the variety of options out there can be a bit of a chal- lenge. Tell me a bit about the decision process for the equipment on this particular project. 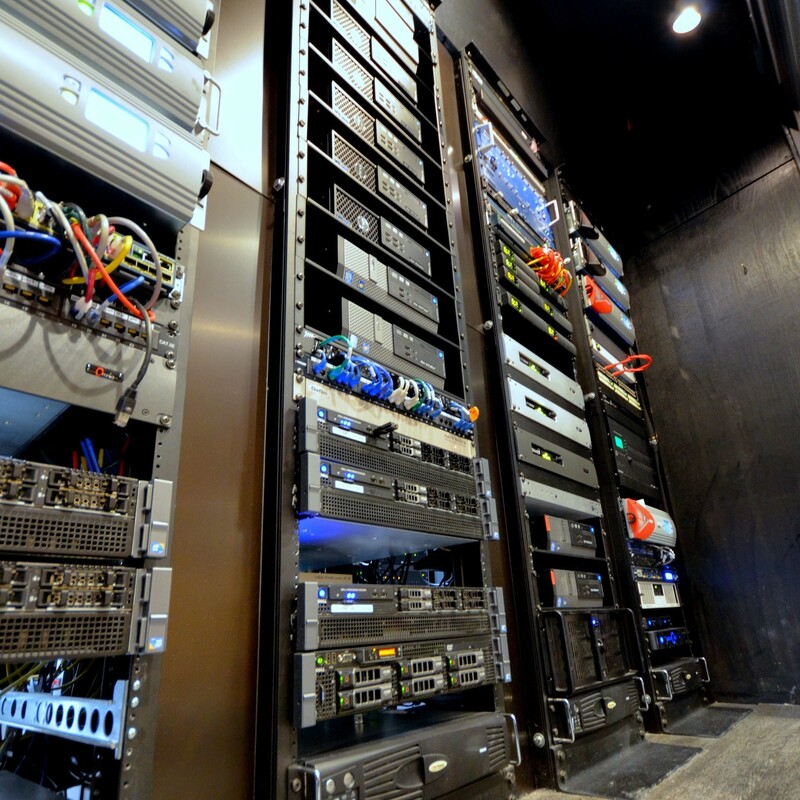 Kline: The audio portion of the facility is handled by an Axia infrastructure using their xNodes for I/O. This approach allowed us maximum flexibility and scalability. We absolutely knew we wanted to build around an IP based system with super flexible GPIO and audio routing capabilities. Using Axia and their Livewire transport allowed us to take advantage of a full broadcast ecosystem. Our VX studio telephone hybrids speak natively to the Axia system, as do our many 25/7 digital delay units. Zephyr ISDN boxes used for guests and backup backhaul also speak Livewire. The automation system used throughout the plant is OP-X. It has been very reliable and speaks directly to Axia using Livewire drivers. The system has various iPad apps for remote control, which we like. APT Oslo frames handle the backhaul to our Westwood One satellite uplink in New York, with ISDN as backup. The APT units run over redundant private and public IP networks, and use Surestream technology to manage that. We also have Intraplex frames with T1 cards. Both the T1 and IP boxes use uncompressed audio. Everything in the plant is AES, and all music is PCM WAV. We literally run linear audio throughout the plant to the uplink. This is not by accident—this is a must for us. Orad provided all of the HD television graphics and switching. We worked very closely with them to integrate their software with our Axia system. For instance, in any studio, the cameras will switch automatically when someone speaks on Mic. If two people are speaking, the system is smart enough to go to a split-screen mode. Of course, you can still switch things manually, but automatic mode lets our producers, board ops, screeners, and video experts focus on other things during the show as needed. Orad is a top-notch company based in Israel. Their graphics package integrates social media such as Facebook and Twitter, which is almost a requirement now for interaction with the audience. Sony provided the PTZ HD broadcast quality cameras. Crestron provided the large video matrix and control system for the many LCD monitors in the studios and throughout the Campus. Omnirax handled all of the custom–very custom–studio furniture. Mika provided the mic and moni- tor arms. 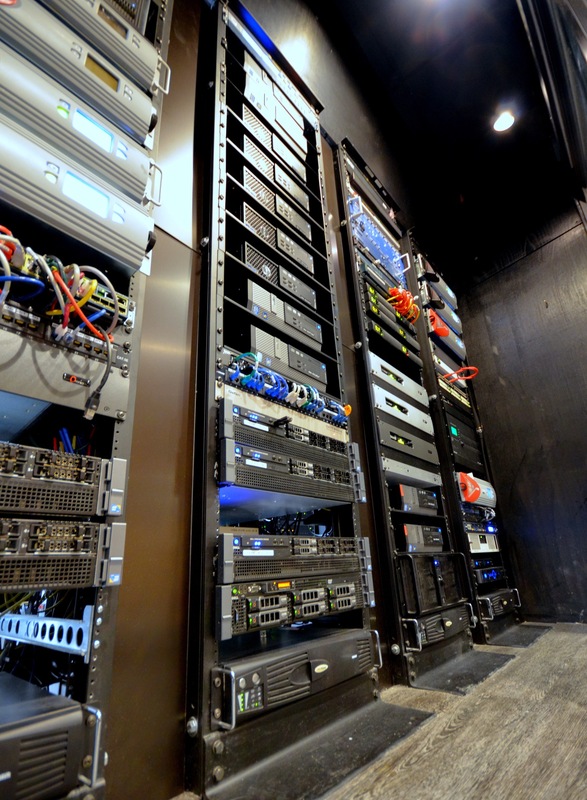 Dell and HP provided the many audio, video, storage, and archiving servers. Sadie and Adobe provided much of the editing software. Radio: These studios are absolutely gorgeous. Attention to detail is important when designing a room with proper studio acoustics—even more so when that studio will be used for video as well. Who did you use for the architectural and studio design? Kline: Anderson Design handled our interior finishes, consulted on overall layout, and was an integral team member working across all disciplines. For example, studio furniture placement had to be carefully coordinated with regular furniture locations, backdrops, and lighting angles. Kathy Anderson’s firm has handled many major projects for both residential and commercial clients, some very famous folks I can’t mention. Ever been backstage at the Grand Ole Opry? That’s her work. West Construction also contributed to the architecture design, and handled all non-equipment construction. Clair Systems (Clair Brothers) handled most of our lighting and video design and integration. Da- vid Holland at Omnirax, as always, was invaluable with studio furniture design as well as giving advice on line of sight and overall layout. There is much more to studio furniture design than choosing a color and size—When you add TV cameras it gets even crazier. Cumulus engineers from around the country drove and flew to Nashville to wire, build, and configure all of the broadcast gear. It was a team effort. 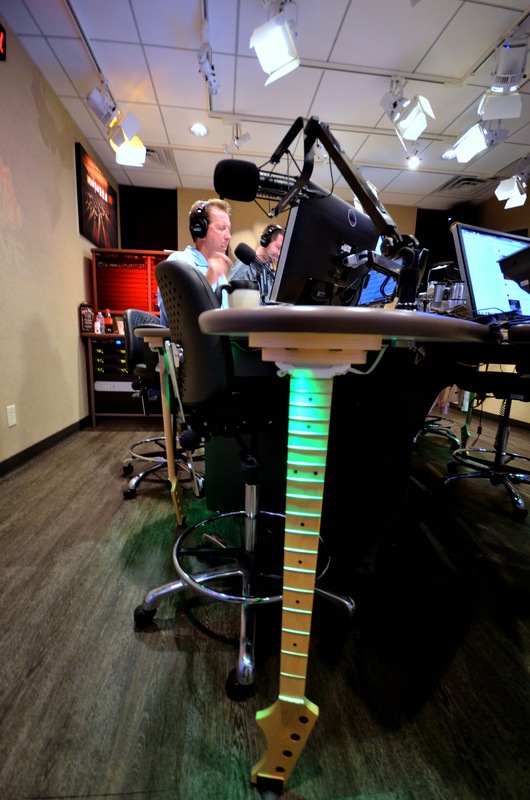 Radio: I see a few very cool features that stand out to me, including a guitar neck shaped countertop leg in the NASH Nights studio. Tell me a bit about some of the more “unique” features of the facility. Is there anything in particular that you really want to highlight? Kline: I think the automatic camera switching based on who is speaking is amazing. Our graphics package for video is excellent and very social media friendly. The lighting control can be handled manually using sophisticated lighting controllers, or via our Crestron lighting package. For example, Kix can walk into his room and convert the entire lighting scene to video interview mode by pushing one button. If he hits another button, all the lights return to normal. We provide title and artist data from all playout systems via a special data path to the uplink, and pass that data to the affiliates of our live programs. Blair’s morning show studio is also a live audience performance space. We can accommodate about 17 people in a very comfortable and intimate environment for ei- ther watching the show, or band performances. The entire studio set can be disconnected (via pre-made cable harnesses) and wheeled off the stage. We have an entirely separate digital mixing console and Clair Brothers designed sound system for these events. The band mixer feeds the Axia system for broadcast use. We have a full Creston matrix for video switching. This al- lows monitors in the lobby, green room, studios, wherever, to be remotely set to show a number of different feeds. We can display the TV feed from a studio in one spot while showing CNN somewhere else. A great example of this is in the green room; Artists can hang out and see what’s going on in the studio before they are interviewed. Oh, and we installed a Sonic Ice ma- chine—The real deal. If you want those little pieces of ice, come by. We’ve got them. We have two green rooms: one of them for artists who visit, and the other for the air talent. Did I mention the full basketball court? Radio: A number of engineers tend to look back at a new facility build and say, “I wish I had done that differently.” You have obviously been involved in a number of facility builds and have learned from those projects, but are there any things that you would change now that the NASH project is complete? Kline: Yes, and I am changing it. We need a larger generator and UPS system than was there before when Citadel used the property for radio broadcasting only. Work is in progress to upgrade both of these things. Radio: Thanks for your time, Gary.